The PacMan Nebula is a star forming region located about 10,000 light years from us in the constellation of Cassiopeia. It derives its name from its resemblance in RGB images to the chomping PacMan character first introduced in the 1980s video game. The beautiful red Hydrogen nebula is illuminated by the bright stars contained in the central star cluster, IC 1590. These stars themselves were formed from the Hydrogen gas. 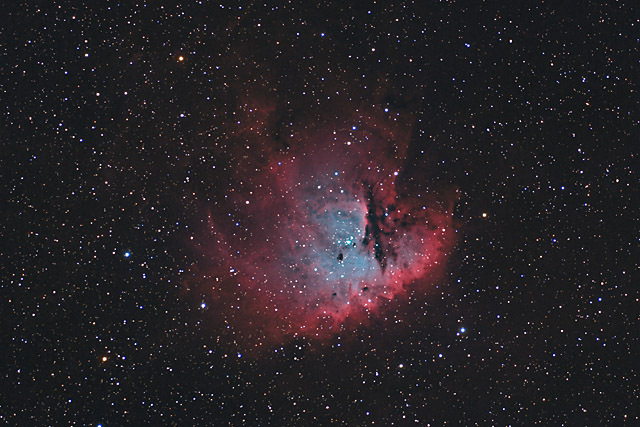 The "mouth" of the PacMan nebula is the silhouette of a large dust cloud. Similar dark clouds can be seen punctuating the nebula. Close inspection of the image can reveal several columns where stars are being born, similar to those seen in the Eagle Nebula's "Pillars of Creation". Software Used Images Plus 6.0 for camera control, Images Plus 6.5 for calibration, stacking, color channel splitting and recombination, ArcSinH stretching, digital development processing, star size reduction, edge masking, and feature mask. Photoshop CS5 used for levels and curves, screen mask invert, high pass filter, lab color, saturation adjustments, selective color, match color, Ha and OIII colorizing, and luminance layering. Gradient Xterminator for gradient removal. Carboni Tools for additional noise reduction and smoothing. HLVG for additional color correction. Registar 64 for subexposure alignment and color channel alignment. Pixinsight 1.8 for star mask generation, image annotation. Notes Almost all of the narrowband images I found for this target were either Hubble palette/false color images, or HaRGB images (color images with Ha filtered data added to enhance the Ha nebulosity). Because the false color images showed that there was a strong OIII nebula contained within the Ha regions, I decided to capture OIII data in addition to the Ha and RGB. I developed some new refinements for my methods of combining the color with the narrowband data, including a better way to use the Ha for luminance. I'm extremely happy with these new processes, as this astrophoto is by far and away the best HaOIIIRGB image I've processed to date. I'm particularly pleased with how well the OIII stands out within the Ha, as well as the accurate blue/green color I was able to retain in the OIII data.